§ 97.115 Third party communications. 25.3 It is absolutely forbidden for amateur stations to be used for transmitting international communications on behalf of third parties. 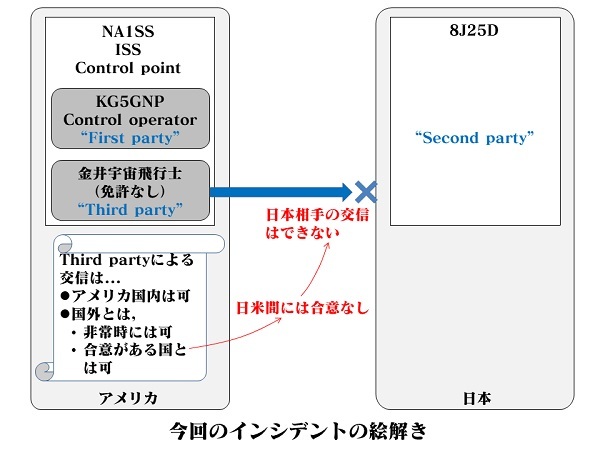 なし 2) Amateur stations may be used for transmitting international communications on behalf of third parties only in case of emergencies or disaster relief. 25.4 The proceeding provision may be modified by special arrangements between the administrations of the countries concerned. →国の間で合意があれば，第三者通信してもよくってよ． An administration may determine the applicability of this provision to amateur stations under its jurisdiction. ●FCC　§97.115 Third party communications. Any station within the jurisdiction of any foreign government whose administration has made arrangements with the United States to allow amateur stations to be used for transmitting international communications on behalf of third parties. No station shall transmit messages for a third party to any station within the jurisdiction of any foreign government whose administration has not made such an arrangement. This prohibition does not apply to a message for any third party who is eligible to be a control operator of the station.